DC Universe Original Animated Movies - JUSTICE LEAGUE: CRISIS ON TWO EARTHS | Warped Factor - Words in the Key of Geek. Some of DC's greatest heroes assemble for Justice League: Crisis on Two Earths. Da'Mon Guy looks back at this DC Comics animated movie. DC Comics is clearly the better of the two comic book giants when it comes to releasing animated feature films, their studios have produced a number of direct to video features that highlight today’s modern mythological marvels who grace the pages of their comics. The quality of their output is very consistent, having turned out a number of great animated features that nearly make up for the lack of success on the big screen. 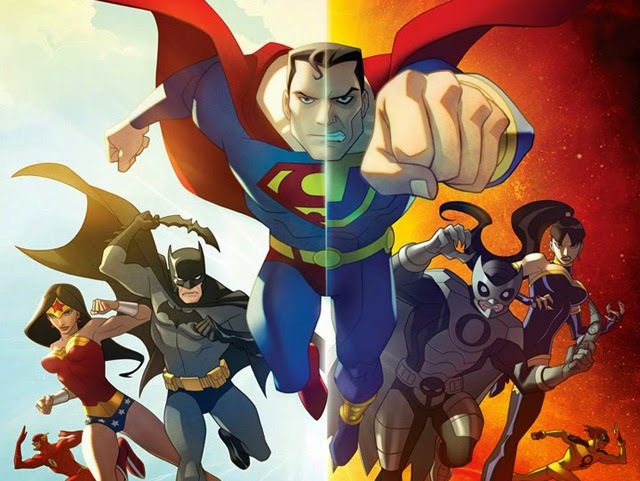 Justice League: Crisis on Two Earths is no different, it is an action packed, dazzling showcase that creatively commingles a high level of realism with an entertaining sci-fi premise to breathe life into an animated adventure which is comprised of the DC Comics super team of heroes, The Justice League. Premiering in the early part of 2010, Justice League: Crisis on Two Earths is an adult themed animated feature that infuses a fantastic tale of science fiction with the fabled Justice League of America to bring forth a unique story of heroism and realism. The film unites DC Comics greatest heroes (Superman, Wonder Woman, Batman, The Flash, Green Lantern, and Martian Manhunter) for an out of this world adventure that surpasses the reaches of the imagination. In addition to the main heroes that are the focus of the film, the film features a number of other characters from the DC universe: Red Tornado, Firestorm, Aquaman, Black Lightening, and Black Canary all make a cameo appearance. “Crisis” implements a creative take on world of gangsters and crime, these criminals have become the overlords of an alternate Earth, using their super abilities to force the government to bow down to their tyranny. The JLA travels to the alternate earth where they encounter the Crime Syndicate which is comprised of evil counter parts of themselves: Ultraman, Superwoman, Owlman, Johnny Quick, and Power Ring. This movie is truly a showcase for the great and powerful characters that comprise the pages of DC Comics. It eloquently allows each member of the Justice League the chance to display his or her abilities, whilst demonstrating good examples of the relationships amongst the individual members of the JLA, and what they all bring to the group. Superman’s leadership, Flash’s quick wit, and Batman’s over analytical nature just to name a few. In this respect, Crisis is one of the best interpretations of the team of super friends. The film bolsters some great cinematography. The animation is very smooth and looks great, much like the style used in Superman/Batman: Apocalypse. It enhances the enjoyment as well as making the film more intriguing. There are also some great epic confrontations that bring to life the incredible powers of both teams. Justice League: Crisis on Two Earth is an entertaining addition to the DC Comics library of films. It shows, and lays, the foundation for DC’s former television series, Justice League Unlimited, and places an interesting variation on Wonder Woman’s invisible jet. Crisis puts the JLA in a modern story that is the one of the best uses of the fabled characters as they make the leap from the pages of comics into live animated action.